What are the best Android smartphones for 2018’s gamer generation? It seems a long time since our trusty mobile handsets were predominantly used for making phone calls. Today, we use smartphones as our window on the world. Surfing the net, dealing with our online finances, staying in touch by social media and watching TV and videos are just a few of the everyday applications. But for more and more of us, gaming is one of the most important uses to which our phone is put. The gaming capability is becoming one of the key criteria by which a new phone is judged. It is our smartphones that have made gamers of all of us. How many executives in their 40s and 50s can remember idling away the time between meetings playing Snake or Brick Breaker on our cellphones back in the 1990s? Today, the games have advanced, and the ability to play online means the possibilities are almost endless. But from games aimed at preschoolers to the latest adults-only Videoslots with their promo codes and deposit bonuses, games are aimed at every conceivable age and demographic. This brings us to the question of which phone manufacturers have been quickest to see the shifting patterns among gamers and develop the best phones to accommodate our love for gaming. Here, we run through four of the best Android smartphones that are on the shelves right now. Samsung’s most recent generations of its flagship smartphone have truly impressed the industry, and most impartial commentators feel that they have beaten Apple at their own game by creating a range that can take on the equivalent iPhones and come out on top. But what do gamers think of the Note 8? The key criteria are RAM, battery life, display and sound. And this is a smartphone that scores well on all counts. 6GB of RAM is more than enough for the juiciest of games, and the 3,300 mAh battery gives the same life as the larger power pack in the S8 Plus. The AMOLED display has also received nothing but praise from gamers, and the ability to easily change settings for resolution, brightness and so on wins it extra bonus points. With the Note 8, gamers tend to agree with everyone else that Samsung has created another iPhone beater. 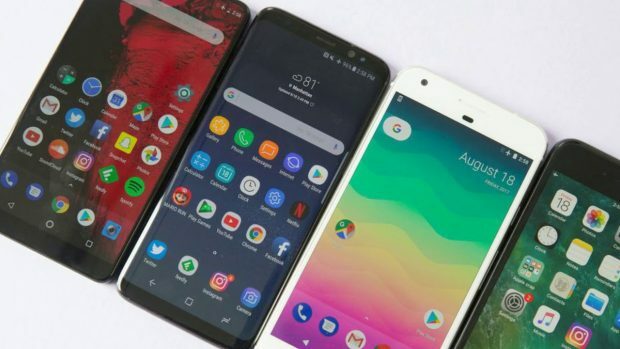 If it was a straight race between the two major manufacturers, that would be an end to it, but when looking specifically at the best Android phone for gaming, there are other contenders that might come as a surprise. Those in the trade felt that the Razer phone would be a short-lived gimmick. After all, with products like the Note 8 on the market, who needs a specialist gaming phone? The answer is more people than anyone could have imagined, and it truly demonstrates how smartphone gaming has captured the public’s imagination. The Razer ticks all the boxes that Samsung’s phone ticks, but twice as hard. The display can only be described as perfect. You might think you are looking at a gaming monitor, and that’s because you are. The Razer has been built by gaming experts for gaming. As for the technical specs, 8GB of RAM and a battery with 4,000mAh capacity are numbers that speak for themselves. For the most serious gamer, there is really no other choice. Motorola is not a name that would immediately spring to mind as competing on level terms with the most popular smartphones. But here’s a manufacturer that has reacted shrewdly to the gaming revolution. The specs are respectable enough, with sufficient RAM, a strong 3,000 mAh battery and a 12 Mp display that does all you could ask. However, it is in the Moto Mods that the company has played its trump card. These give gamers the added flexibility to use their phone as a projector or add traditional gamepad buttons as peripherals. Motorola has seen the future of smartphone gaming and grabbed it with both hands. The OnePlus has slowly but surely been garnering a reputation as the smart person’s smartphone. At around half the price of a Samsung S8, the specs attached to the OnePlus might come as a surprise. It has the same RAM as the Razer, the same battery life as the Note 8 and the same display at the Moto Z2 Play. This really is the surprise package, and while it might not have the bells and whistles of its more fashionable competitors, it is a lot of smartphone for the money, and has to be a compelling choice for those on a limited budget.